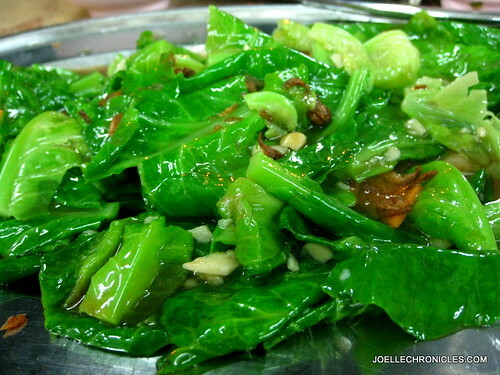 JOH Chronicles: Sin Huat Seafood Restaurant: Die Die Must Try? Sin Huat Seafood Restaurant: Die Die Must Try? As is invariably the case, plans to visit the Food Nazi in Geylang were made over the dinner table. We were curious to find out what was so special about this dingy, hole-in-the-wall restaurant which had food critics from both the Discovery Channel and The New York Times raving. Was the beehon crab really THAT good to warrant an entry in Anthony Bourdain’s restaurant bucket list (one of only 2 restaurants he recommends in Asia)? 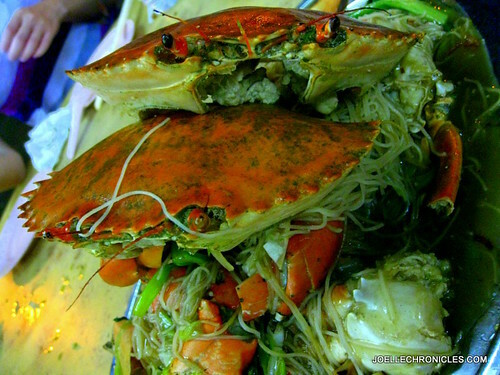 Anthony Bourdain: Sin Huat is a wonderland of fresh seafood—notably the Crab Bee Hoon. The service, however, could be described as borderline hostile, and the décor? Nonexistent. 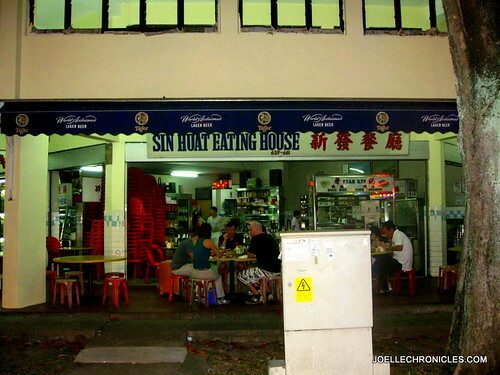 http://ieatishootipost.sg/: It was a combination of exorbitant prices and the chance to be abused that prevented me from eating there for such a long time... The verdict: Shiok. Best crab bee hoon so far! Aside from the smaller claw being slightly atrophied, the rest of the crab was solid. The Bee Hoon was not too dry nor too wet and had wonderfully soaked in the flavours of the crab, ginger and that mysterious stock. The hype and infamy really added extra value to an already very tasty dish! It just goes to show that even bad service can sometimes become a positive marketing strategy! Makansutra: We will warn again, despite the various complaints about the service and price no one really has something seriously bad to say about his food! Danny serves one of the meanest fried crab beehoon, which is also the most expensive of the lot and he comes with a take-it-or-leave it attitude. His huge Sri Lankan crabs are specially imported and thus cost more. The ultimate secret weapon is the sumptuous stock that he uses to fry the beehoon (only one brand preferred and used) and the crabs to sweeten it. Avoid it if you are impatient and don’t think crabs should cost this much! We left the house and headed for Geylang one lazy Sunday aftenoon feeling a mixture of excitement and apprehension. Would Danny Lee be in a good mood today? I wonder who long it would to (a) get a table and (b) get fed? Would the wait, expense, and forewarned abuse be worth it? 4 hours later, the answer was a responding HELL YES! DIE DIE, MUST TRY indeed. The food was served one dish at a time. First up came the scallops. Oh man were they scrumptious! Caveat, if you like your scallops cooked simply with garlic and a touch of white wine, then this dish probably isn’t for you. 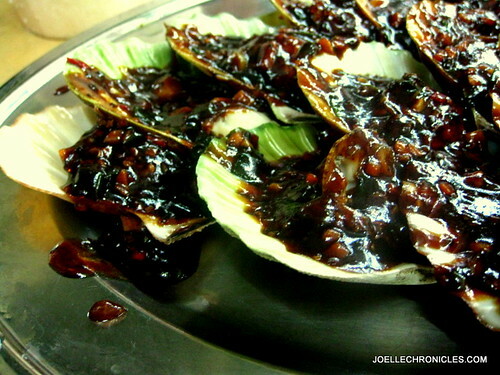 Sin Huat’s scallops were freshly steamed and served in a virtual soup of intense black bean sauce. The meat was light and tender, not chewy like what you might get in most seafood restaurants. I would have appreciated it more if the sauce had been toned down a little bit but overall, it's a dish that I would highly recommend. 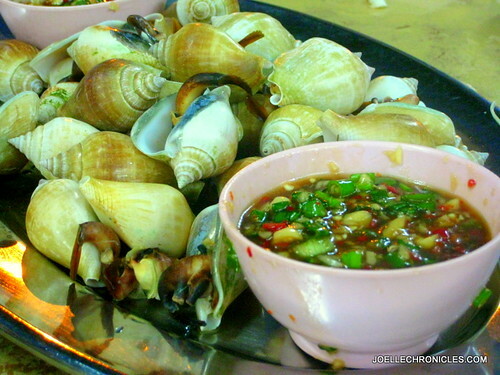 Next up, steamed gong-gongs (mini-conches) served with garlic and chilli sauce. Andre whispered to me -- "Are you going to eat that snail?" Well, yes I did indeed eat a lot of those "snails". I wasn't too impressed - it was the garlic and chilli sauce which made the dish. I place this item in the bucket "Been there, tried it, probably never again." We were nearing the 2 hour mark and our crabs still hadn't shown up. Our tentative follow-ups were brusquely brushed aside and since we couldn't speak Mandarin, we were left in the growing darkness - wondering, waiting, hoping. It was a good thing that the fish arrived. Ohhhh, the fish was good. The meat was tender and steamed to perfection. 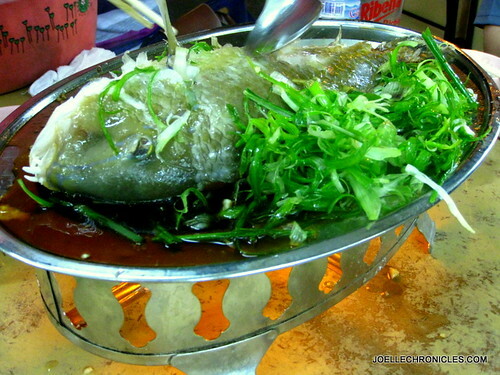 For 2 of our dinner companions, this dish was best of the lot (yes, even better than the crabs). No wonder it cost an arm and a leg, but that's another story. We were already fairly stuffed and the crab was still M.I.A. The table next to us had already finished and were settling their bill. Needless to say, we were getting a bit angsty because the crabs were the sole reason why we trekked to Sin Huat in the first place. We kept ourselved amused by inventing plausible explanations for why the crab was so late ranging from "Danny only knows how to cook one dish at a time" to "Aha, it's a strategy. You think the crab is good because you wait soo long for it". It turns out that the correct answer is all of the above. According to Makansutra, Danny "only knows how to cook it (the crab) one plate at a time". The crab is always the last dish to be served. The build-up of anxiety and anticipation suddenly transforms into such gratitude and and wonder when you behold la piece de resistance that you would be hard pressed not to agree that yes, the Beehon Crab in Sin Huat is shiok. Die die must try. We left Sin Huat a little over 3 hours after we plunked our posteriors on those red monoblock stools, completely satiated yet hankering for dessert and/or coffee. Would I recommend it? Yes and no. Yes, I’d recommend it to those who like good food and aren’t too fastidious about little things like service & ambiance and have abundant time to kill. No, it wouldn’t be at the top of my list because I feel that Mellben’s is more consistent and reliable. Then again, who am I to judge? Go to Sin Huat for yourself and let me know – would YOU include it on YOUR bucket list of restaurants to eat before you die?